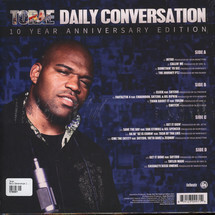 Torae’s breakthrough project ‘Daily Conversation’ is finally getting a vinyl release for its 10th anniversary. The project that started it all features production from DJ Premier, 9th Wonder, Marco Polo, Khrysis!! !, Black Milk & more. “Since its release, people have been asking for me to put it out on wax. Myspace days, up to DM’s on twitter. So I figured a 10 year anniversary release would be dope. And what better way to celebrate some new vinyl than on Record Store Day,” says Torae about the thought process behind releasing ‘Daily Conversation’ now.